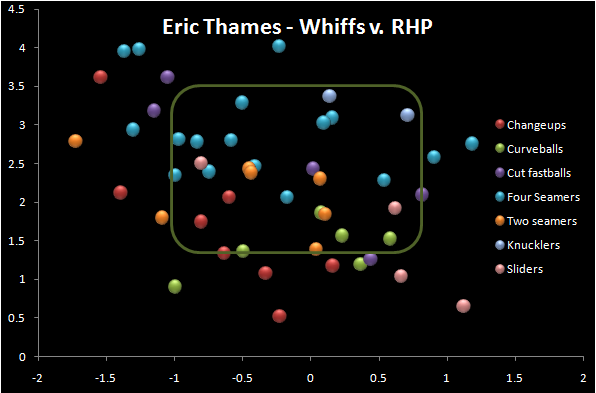 Ghostrunner on First: Where are we on Eric Thames? I like Thames, but this is newbie luck... Really, the BABIP is way high and the league will figure him out followed by a serious regression and trip back to Vegas. The walk rate is a major concern in my view, but I'm gonna ride that smile as long as it goes! Also - he's big time trade bait right now IMO. He is the smileyest player since Torii Hunter? He might also be the veiniest player since Giambi. Those forearms are frightening. I feel like the bulk of us are just enjoying the early wave he's had. We'd rather see him playing than Juan Rivera and he's kept us interested enough in the Jays until Lawrie gets called up. I'm drinking some of the cool aid and hope he's a future masher, but at the same time he has a low ceiling like JPA. The power is real. The on-base is going to collapse this year, but I still think has long-term potential. Based on his minor league track record and that pretty swing (and some completely uneducated extrapolation), I'd hazard that he could fall somewhere between a left-handed Edwin and a same-handed Lind once he finds his level.